The joy of being SaddleDrunk. The hills at this time of the year are expelling amazing scents, astonishing blinding colours and "Allegro" sounds from the birds. Few days later, I have managed to meet up with a friend to collect the bike for the event "Over The Hills" on saturday.The piece of art was a Bianchi of Pantani's Gregario Davide"Gavino" Dall'Olio from the "Tour De France 1998". The bike was a size bigger then mine, with extra 4kg and a nice crank set 53/39, and a cassette 11/21. I felt really happy having the chance to ride this jewel, therefore, I only changed the saddle and the pedals. I did not have a chance to go for a test ride, so it was a complete surprise to me when I have start feeling the pressure of riding it,especially starting the race at the front of 700 hungry riders. It was nice to see so many cyclist with shaved legs, massage their legs with warming oils,eating millions bar of gels, sipping litres of energy drink down their necks. I was completely flabbergasted.The competition was definite on for those.Not for me, I was there for the show. Few of SaddleDrunk riders enjoying the view from inside ex Formula 1 track of Imola. The start was given using the race track lights,and like wild dogs escaping from the cage we sprinted off,and wow, it was interesting to see even for the first 25/30 km the pace was rolling really fast.If you ask me, i don't remember to see anything else apart for wheels and smells burning rubber from the brakes. I was going to go for the 160km long,but with this bike it was going to be hard after I have climbs 2 cols with climbs between 7% to 16%,therefore I have adventured my self to the 120km instead.I think I made a wise choice there.I was rejoined by others at the top of the hill.A lot of riders were complaining about the lack of "ristoro" ( food station).Only one ristoro at km 60, in a warm day. In the middle of the Apennines on the border with Tuscany. Well it was hard,it was my slowest 120km ever. I was pleased, because now I can say I have ridden that old bike. The cycling technology has definitely improved,the compact crank set and all the rest make cycling much easier. The finish line was the same as the last "Formula 1 Grand Prix of San Marino in 2006" won by Schumacher. Food Station in the Pit Lane. The Pasta Party with Piadina. The following day, was an other early wake up,5 am, for a more relaxed Granfondo. The "12th Wines & Taste Road of the Forli and Cesena Hills Granfondo" was organised by "Polisportiva Bertolt Brecht Russi", where offered a great welcoming environment, relaxed riders, plenty of food stations to feed an entire army. The start line is building up. Over 3000 riders,paid only 7 Euros to take part at this event. List of the teams hanging in the main square. Filling the water bottles at la "Fontana" while being entertained by a local. 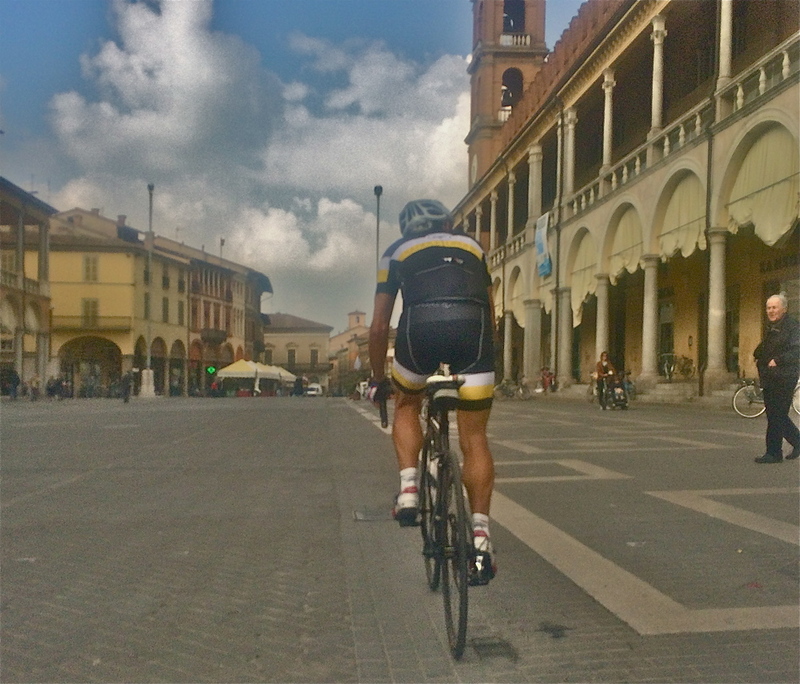 In Faenza's town square on return from the Granfondo. SaddleDrunk team nearly won the ceramic trophy for being the team travelled the farthest.Unfortunately we were only 3, therefore we were not entitled for the trophy. The ranking was only for the teams and not individuals. It means to get ranking they wanted to see how many riders took part, what distance was covered.We got 205th out of 292.Well done team. I would like to say thank you very much to Michele Tampieri of Over the Hills, Gianni from the "Polisportiva Bertolt Brecht Russi" to invite SaddleDrunk Team to their events. It was a pleasant few days away,with the chance to get SaddleDrunk. Ciao for now,let's get SaddleDrunk.